In our cordless drill review series let's have a look at the cordless drill batteries, one of the most important single components of a battery drill. This cordless drill batteries section is part of a multi-part article series on cordless drills. The initial main review of the best cordless drill can be found here. When it comes to decide which is the right cordless drill for your needs, the main question starts on deciding " How many Volts a Cordless Drill Battery should have? " Cordless drill battery packs are based on single 1.2Volt battery cells. These cells connected in a row are what makes the different sizes for rechargeable batteries for drills. Small cordless screwdrivers start from 2.4 V to 7.2 V in steps (2.4V , 3.6V , 4.8 V, 6 V , 7.2Volt). The foremost basic - or - main cordless drill segment was used 9.6 Volt battery packs, quickly moving upwards to the 10.8 V sizes. 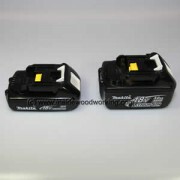 Picture shows 2 similar Makita lithium battery packs (18 Volt) for cordless drills and other cordless power tools. On cordless drills with much more power and torque, batteries with 14.4 V and mostly 18Volt are used nowadays. 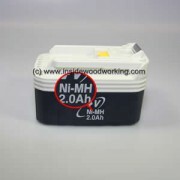 Above these levels some manufacturers such as DeWalt, Makita or Bosch offer 24 V , 28.8 V and even 36 Volt batteries, mostly used in cordless hammer drills. Amps per Hour or Ah - or What kind of batteries for cordless drill will last longer ? Battery pack to the left comes with 1.5 Ah , while the one shown on the right provides 3.0 Ah. Same voltage means similar power, but more Ah will provide the power for a much longer time at the expense of and increase in battery size and weight. Rechargeable Nickel-Cadmium Ni-Cd batteries have been around for the longest time. These types of replacement batteries could be called somewhat "First Generation". Low in capacity (Ah), get warm during charging and come with a significant "memory effect" for non-empty recharging. 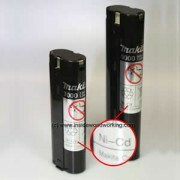 Somewhat seen as the second generation in cordless drill batteries, nickel-metal hydride Ni-MH batteries are already a significant improvement over Ni-CD akku packs. During Recharging - absolutely no "memory effect"
This is the type of drill battery you want your cordless drill come with if you are a professional woodworker! What Type of Cordless Drill Batteries Should I look for? 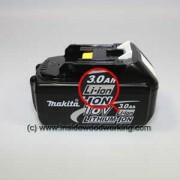 As with all cordless drill parts you want to find the right kind of battery for you. Considering you are a professional woodworker, cabinet maker, framer or any type of professional in the trade you what to go for Lithium Ion batteries. Not only do they provide the most lasting power (higher Ah) they also come with lots less weight. And less weight is what separates an excellent from a mediocre cordless drill. Should I upgrade existing cordless drills to Lithium Ion battery packs? Do the new Li-Ion batteries fit my old cordless drill model ? Will I need a new charger - for lithium ion batteries ? How much expensive are li-ion batteries compared to Ni-Cd or Ni-MH types? Those are the areas you want to check with your cordless drill dealer before you decide on upgrading and replacing any old cordless drill battery. After looking in detail on the various types of cordless drill batteries available, lets have now a closer look into cordless battery charger types and how those can become an expensive accessory.